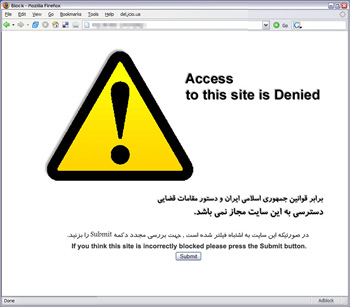 According to Reuters, Google's search and Gmail services have been blocked from public view in Iran. Tehran officials say these latest additions to Iran's web filter are the result of a much publicized anti-Islamic video called "Innocence of Muslims". The controversial video made its home on YouTube a couple of weeks ago, where it has managed to incite anger, protests and violence across portions of the global Muslim community. Iran already has one of the largest collections of blocked URLs found in any country, but that's just the start. Earlier this year, Iran announced plans of creating its own domestic "Internet" -- an intranet which would be isolated from the rest of the world. Officials claim the goal is national security, something Iran is rightfully concerned about after government servers were infiltrated by US-Israel sponsored Stuxnet and Flame viruses. Skeptics, however, believe Iran's claim of "national security" is little more than an excuse to keep protesters away from "Western" social media tools and non-sanctioned information. ComputerWorld says this security researcher has confirmed that Google and Gmail are still accessible via direct IP addresses although their hostnames remained blocked. It also appears some mobile phone operators aren't on the same page yet as the Iranian government, allowing mobile access for some -- for now. Tehran officials says phase one of Iran's upcoming "domestic Internet" has already passed, isolating government operations on its own national network. Phase two, which is expected to arrive sometime next year, will put the rest of Iran's population on their state-sponsored intranet. After the system is deployed, it remains unknown if there will be gradual transition from the global Internet or if Iran will abruptly cut ties.